At some point in our lives, many of us have a crisis - of health, faith, security, etc. And sometimes, out of that crisis, comes a blessing - something we'd have never seen before that crisis. This happened to our featured member, Ron, in 2011 when he found he needed cardiac surgery at age 56. Ron had been very active and particularly loved playing basketball. He asked his surgeon if there was a chance he'd be able to play basketball after the surgery and was told "there's a chance..". As he recovered from surgery, Ron believed he had a 2nd chance at life and knew he had hard work ahead of him. Ron explained that his first challenge was coping with fear about what his level of activity could be. He clearly remembers walking from his room in the Cardiac ICU down the corridor and back. He said that, from that day forward, he's never looked back. He credits the Cardiac Rehab program and the DAHLC with being his lifesavers. "The staff in both places are fantastic, encouraging and the best in the world". In the Cardiac Rehab program, Ron found that being monitored while exercising reduced his fear and was a great confidence-builder. 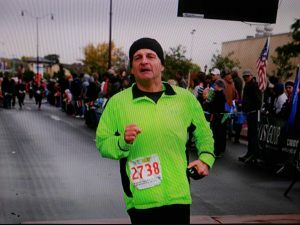 In August 2011, Ron completed the rehab program, began his membership at the DAHLC and was jogging for a couple of minutes at a time. He said "the day I ran my first lap at the DAHLC, I was in tears". By the time he could run a mile, Ron was hooked on running. "I've made some great friends who have encouraged me along the way, and I will never forget them. Four months after surgery I ran my first 5K. In another 5 months, I was playing basketball. On Oct. 20, 2013 I ran my first half marathon. On May 14, 2016 (5 years & 2 weeks since bypass surgery), I ran the Lake Wobegon marathon - my first. It's hard to believe I put in 500 miles training for that run. Being at the starting line was a win in and of itself. It was overwhelming and I finished the race strong. This was a moment when I knew I was at peace." To those facing the challenge of starting to exercise, Ron says "Don't ever, ever give up! If you want something bad enough, only you can decide what it's worth and how much effort you're willing to put into it. Anyone who exercises complains about the time, effort, aches, pains; but if you ask them they will also tell you about the tremendous enjoyment, friendships and fulfillment it will also bring. To me, the future looks awesome and each day is a gift!"